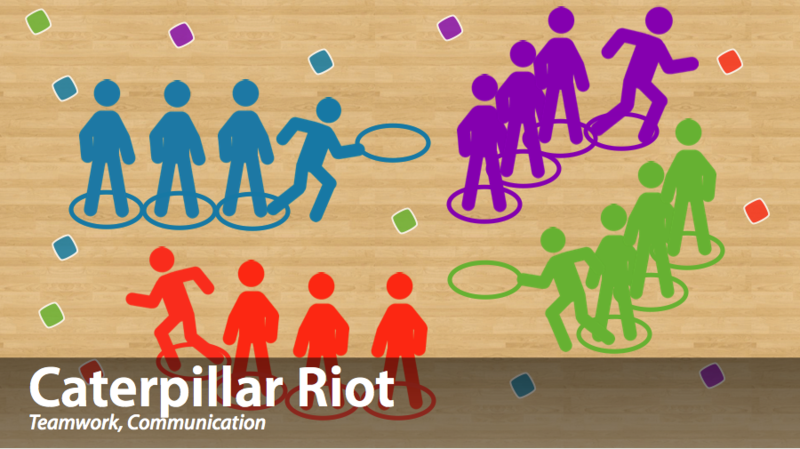 Caterpillar Riot is a Standards-based Cooperation game that is perfect for Elementary level PE programs. It focuses on Teamwork and Communication. Caterpillar Riot can be played in a gym or outdoors. Students are in teams of 5-6. Each team stands in a line with each student standing in a hoop (the hoops should be touching). Each team is called a caterpillar. The goal of the game is to collect as many objects off the ground by having your caterpillar move forward. To move forward, the last player in line steps into the player of front of their hoop, picks up their empty hoop, and passes it to the front. The front player then places the hoop on the ground and steps into it. Every player then shifts forward and the caterpillar has moved. Only the front player may pick up objects, but it is the team’s job to carry collected objects throughout the game. The game ends when there are no more objects on the ground. Before having the students play the full version of the game, have them practice moving their caterpillar by setting up a race. Each team lines up behind a line in the gym and the goal is to get pass a line that is on the other side of the gym before time runs out. Players now play the game with the full version of the rules but with an added time constraint. Have all the players on a team blindfolded except for the last player of that team. That player must guide their team throughout the activity. What system did you set up to have your caterpillar move efficiently? What were some obstacles you faced as a team in this game? How did you overcome those obstacles. Students should pass the hoops forward properly (without throwing them). Students should not place hoops too far apart from each other.